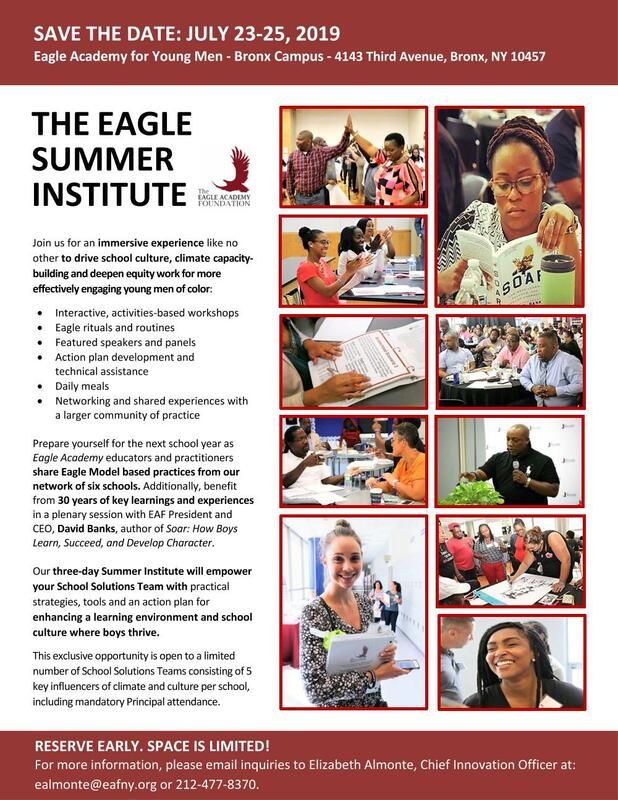 EAF’s three-day Summer Institute will be facilitated by experienced Eagle Academy educators and practitioners sharing research and evidence-based practices from Eagle’s six (6) schools and over 30 years’ experience from David C. Banks, EAF President/CEO and author of Soar: How Boys Learn, Succeed, and Develop Character. See the flyer below for additional information. Registration portal available soon. Note: Receipt of full payment or a certified purchase order (as payment guarantee) will be required to finalize registration for this conference. Reserve now, space is limited! Eagle Academy Foundation seeks to improve the academic and life trajectories of young men of color by broadening the reach of its proven model. • The Eagle Institute will increase the number of schools with positive cultures and interventions intended to support the academic achievement and socio-emotional flourishing of Black and Latino male students.• The Eagle Institute will enhance the capability of school educators to effectively meet the needs of male students of color.• The Eagle Institute will be an active lab for producing much needed research and development of effective tactics and programs for engaging and developing high achieving young men of color. EAF intends to work with local traditional public schools to share effective practices to educate and support young men of color. Through the Eagle Institute, the investment of training and support for the educators of existing public schools will improve the outcomes for young men of color in those schools. 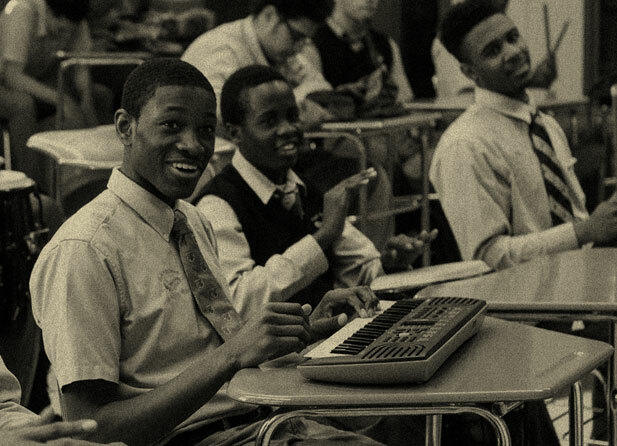 Although 50% of students come to the Eagle schools performing below grade level and 25% arrive with special needs, Eagle creates a community where high expectations and unconditional love allow Black and Latino boys to thrive: • At Eagle 73% of special needs Eagle scholars graduate high school, as compared to 13% of special needs students in New York City. EAF leadership will manage the Eagle Institute working with its own Eagle educators to provide training and technical support to other educators in public schools to improve the education outcomes of young men of color in those schools.